Teeth grinding is, unfortunately, a sound that a lot of parents may be familiar with. A lot of parents worry about their children as soon as they start to notice their teeth grinding regularly. This mainly occurs whilst they sleep but is also known to happen whilst they’re conscious. Bruxism is the medical term for the involuntary grinding of teeth. But whilst it seems like it could lead to a multitude of problems, it’s not as bad as you might think. Our Berwick dental clinic has prepared this article to help you better understand bruxism and how to prevent it. If a child’s top and bottom teeth are unaligned then this may cause them to grind their teeth. If they’re in pain – such as an earache – then they may grind their teeth as a way to alleviate the pain. Stress or anger can cause children to grind their teeth. But as stated above, these symptoms usually only develop in extreme circumstances when the child is grinding and clenching quite forcefully on a very regular basis. In many cases, the child will not even realise they’re grinding their teeth. It is usually an outside party – such as a parent or sibling – who will take notice. The biggest giveaway is when you can actually hear them grinding their teeth whilst they sleep. Otherwise, if your child is complaining of pain in their jaw after they wake up and having trouble chewing with ease, then they probably have bruxism. How to treat and/or prevent it? If your child has shown signs of bruxism or you think they may be grinding their teeth, then it’s best to just take them to a dentist in Berwick. The dentist will examine their teeth for any cosmetic injuries such as chips or worn enamel. They may also spray air or water to test the sensitivity. If any damage is found, then through a series of questions the dentist will be able to deduce whether the grinding is due to anatomical reasons or something else like stress. 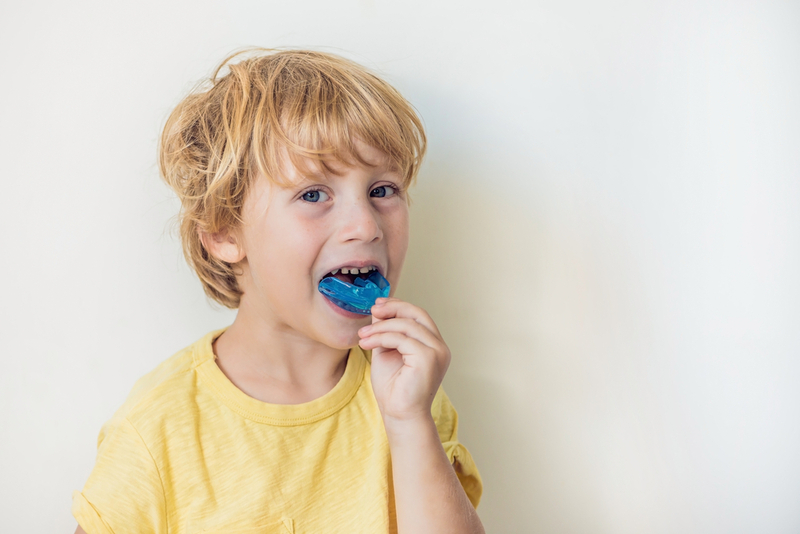 Mouthguards can be moulded out of your children’s teeth so that they may wear it at night, this won’t stop the grinding itself overnight, but it will stop the sound and protect their teeth in the process. It can take a bit of time to get used to and they may not want to wear it at first but it one of the easiest and effective ways to combat bruxism. Other methods of alleviation include taking a warm bath, reading a book or listening to some soothing music. If your child is grinding due to stress, it is important you talk to them and find out why they’re stressed. If you’re able to reduce their stress, then this could cause the grinding to ease up if not stop altogether. This answer can depend on a multitude of factors. Some children can grow out of it, primarily when all of their baby teeth fall out, but for others, it may continue well into adolescence and even beyond. If the source of the problem is stress, then it is most likely that bruxism will stay with the child for a while after they’ve grown up. Because stress is such a big cause of bruxism, it is important to make sure your child is as comfortable as possible growing up, make sure you talk to them about their feelings on a regular basis and that they’re happy. Need a dentist in Berwick? Eden Rise Dental is a friendly, family dental clinic located in Berwick that offers a wide variety of dental services including children’s dentistry. If you’re worried about your child grinding their teeth then please don’t hesitate to book an appointment by giving us a call on (03) 9702 6111 or contact us through our website here.